A great way to shift our focus inward is through breathing exercises. The exercises below can be used at any time throughout your day or if you’re feeling inspired, build them into your daily routine. Find a quiet and comfortable place where you can sit or lie down. Notice if your clothing is restrictive in any way and make adjustments as needed. Find a posture that is restful and that can be held for several minutes or more. Close the eyes or maintain a soft gaze and start to notice your breathing. If you are on the go or at work and this isn’t possible, skip right to closing the eyes or setting a soft gaze and start to notice your breathing. Once you’ve observed your breath for a minute or two, try “smooth out” the breath. The breath should feel effortless, not labored. Inhales and exhales might begin to get longer and you may feel more expansion in the rib cage on your inhales. Now we can begin the exercises! Dirga pranayama is a great way to relax the body and quiet mental chatter (Monkey Mind). In dirga pranayama, we observe the breath as it flows through the chest, rib cage, and belly (three parts). On the inhale, we fill the belly, rib cage and then chest. On the exhale, we reverse that, releasing chest, rib cage, and belly. Three-part breath stimulates the body’s relaxation response and massages our internal organs. Step 1: Bring both hands to your belly and take a deep inhale, sending the breath into the belly. Feel the belly expand into the hands. Step 2: Exhale and notice the contraction of the belly. Before moving to step three, take 2 or 3 rounds of breath like this. Step 3: Move one hand to your rib cage and inhale. Send the breath to the belly and then to the rib cage, again noticing the body expanding into the hands. Step 4: Exhale from the rib cage and then the belly, feeling the body contract beneath your hands. Before moving to step five, take 2 or 3 rounds of this breath. Step 5: Move the hand on the rib cage up to your chest. Inhale – filling the belly, rib cage and chest. Use your hands as a guide, sensing the expansion of the breath it moves into the belly and all the way up to the chest. Step 6: Exhale from the chest, rib cage and then belly. Repeat steps five and six as many times as you like. In kumbhaka pranayama, breath is retained after an inhale or exhale. At first, this can be difficult. Our bodies need oxygen to function and holding the breath may cause our minds to panic. Breath work is just like asana, it takes practice. With time, your mind will calm down and the amount of time that you are able to easefully retain the breath will become longer and longer. Once you’ve practiced kumbhaka pranayama for a bit, you might find that it’s especially helpful at times when you feel panic or anxiety. Step 2: If retaining the breath on the inhale, hold the breath at the end of the inhale for 3 seconds. The hold should be as relaxed as possible. Try to relax the muscles of the body, especially the face. If retaining on the exhale, let the breath go and hold on empty for 3 seconds. Again, relaxing as much as possible during the retention. Step 3: For inhale retention, slowly release the breath. Take another deep breath and hold again. If you’d like to add another second or two, feel free. For exhale retention, take a slow inhale. Exhale the breath and hold on empty, adding another second or two as you wish. Repeat for 10 breaths and then let the breath be natural. Bring your awareness to the mind and body and take note of or jot down how you feel. Nadi shodhana is said to balance the brain and enhance mental clarity. Since the practice requires a gentle focus, it tends to have a calming effect on the mind. Before beginning the practice, it can be helpful to clear the nasal passages. If one side of the nose is blocked, try a dab of a nasal clearing essential oil (peppermint, tea tree, eucalyptus) or Tiger Balm at the base of the blocked nostril. Step 1: Bring the index and middle finger of one hand to rest on the space between your eyebrows (third eye). Step 2: Take a deep breath in and a deep breathe out. Step 3: Use your thumb to gently close the right nostril and inhale with the left nostril. Step 4: Use your ring finger to close the left nostril and exhale with the right nostril. Step 5: Keeping the left nostril closed, inhale through the right nostril. Step 6: Close the right nostril and exhale left. Repeat the cycle 3 to 5 times and then drop your hand and return to your natural breathing pattern. Take a moment to notice any changes in the mind and body. The Sanskrit word yama is often translated as “abstinence” or “regulation”. 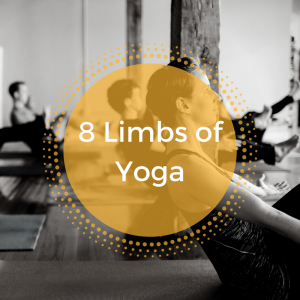 There are five yamas that outline the ethical path of a yogi (according to Patanjali’s Yoga Sutra), below we’ve highlighted each yama and offered suggestions on how to integrate them into your asana practice. An effective way to incorporate ahimsa (nonviolence) into your asana practice is to become more aware of your true self and pay less attention to your inner critic or what other students are doing. Self-criticism and comparing yourself to or judging others are unhealthy behaviors both on and off the mat. Yoga studios are vulnerable places for many of us. Respect your fellow yogis and yourself, be kind. Every body is unique – inside and out. While hanumanasana may be easy for some students, others will struggle. Our anatomy can also prevent us from accessing a pose, no matter how consistently we practice. Approach your asana practice with kindness and curiosity. Notice when you begin to feel restriction/tension in a pose and listen to your body. Let your movements be guided by satya. 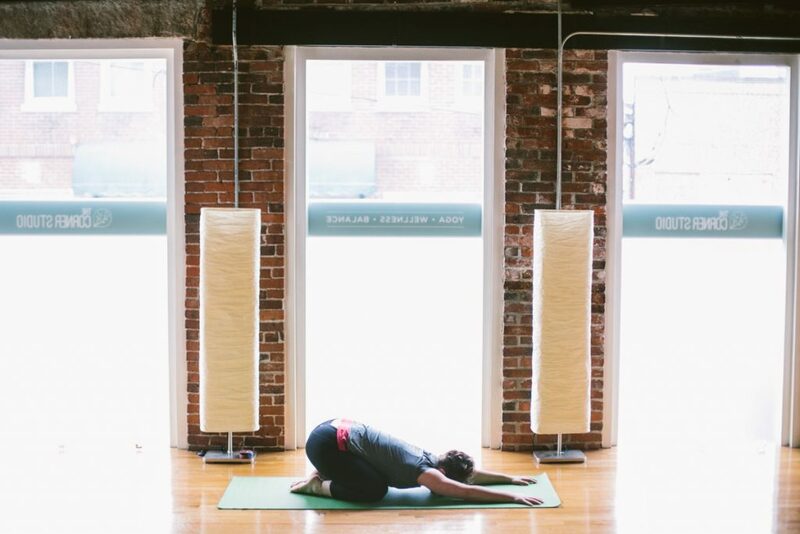 When practicing yoga in a studio setting, you likely have yogis to your left, right, front and back. We arrive on our mats to practice yoga together, but how often do we consider each other or the space we are in? …Are you reluctant to move your mat to accommodate another student? …Are you stealing time from the other yogis in the class by not showing up on time, or not showing up for your reservation at all? …Are you taking away from someone else’s experience (or your own) by rushing out of class or carelessly returning props? We unconsciously take from others and ourselves all the time. Mindfulness keeps us honest, non-stealing. Take a moment to identify what your impulses are during yoga practice. Examples of impulses might include up-leveling everything or skipping every challenging pose. Once you’ve identified the impulses, practice brahmacharya to conserve and enhance your vital energy. Use brahmacharya to create balance in your asana practice. Many times, we arrive to a yoga class expecting to receive something – a specific pose, words of encouragement, a feeling of community. During class, we may set high expectations for our bodies – flexibility, endurance, strength, balance. If our expectations are met, we are happy. If they aren’t, we are disappointed. Next time you arrive to class, tap into aparigraha (non-greed/non-attachment). Release expectation and focus on the present moment. We do ourselves a disservice by linking expectation to happiness. By releasing our attachment to what we want or expect, we allow ourselves to receive what we need. In today’s world, life’s pressures can leave us feeling scattered, wound up and anxious. Some days it can be a real challenge to shift into relaxation mode. Coupled with breath work, the following restorative yoga poses can help us transition from a busy day into a restful evening. While in this pose, we can distance ourselves from our stressors and quite literally “turn inward”. This pose calms and soothes the spinal nerves. It also stretches that hamstrings and the muscles along the spine, which can provide relief from back pain. How to: Stand on both feet hinge forward at the hips, bringing hands to the floor, blocks, your shins, or dangle holding opposite elbows. To make this pose extra restorative, bend the knees enough to rest your ribs on your thighs. You could also do this with a pillow between your belly and your thighs. This pose relieves tension through the spine. 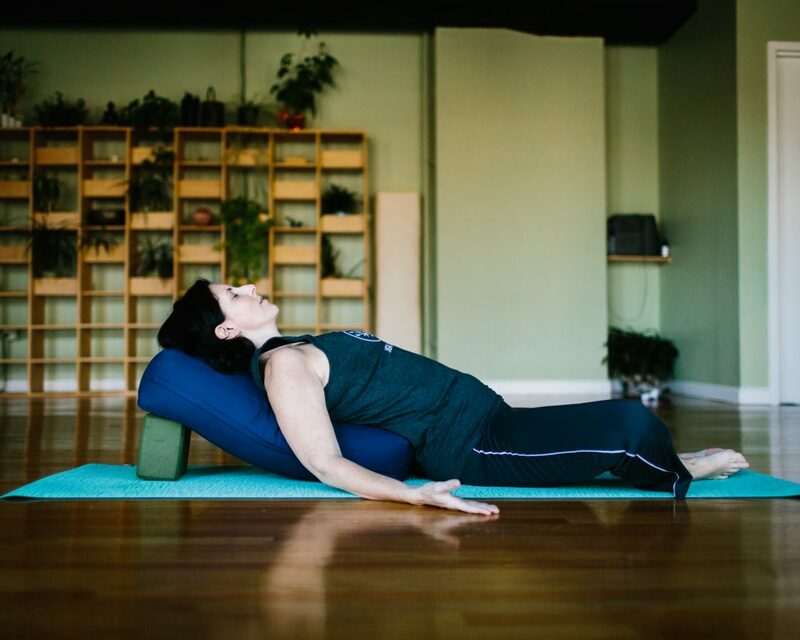 The support of a bolster encourages additional relaxation. How to: Sit on the floor with your feet off to one side and the knees staggered. Twist away from the feet and fold onto a bolster, or a stack of pillows. This pose gently stretches the inner thighs, enhancing circulation to the abdominal organs. The gentle chest stretch allows us to breathe easier. How to: Set a bolster or a stack of pillows behind you. Lie back onto the bolster. (note: make sure your head is higher than your heart. Backbends can be energizing rather than calming.) Allow the soles of the feet to press together and the knees to fall open. 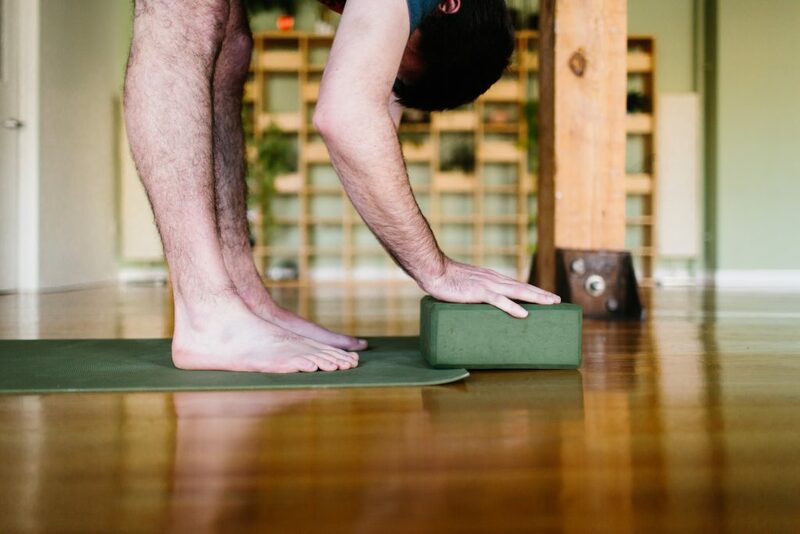 For additional support, place blocks outside the knees or thighs. This grounding posture gently opens the hips and calms the central nervous system. How to: Start on all fours. Let your hips sink back toward your heels. The knees could be together, or spread apart. Allow your forehead to rest on the floor, a block or the backs of your hands. The arms can extend overhead, or drape down by your sides. 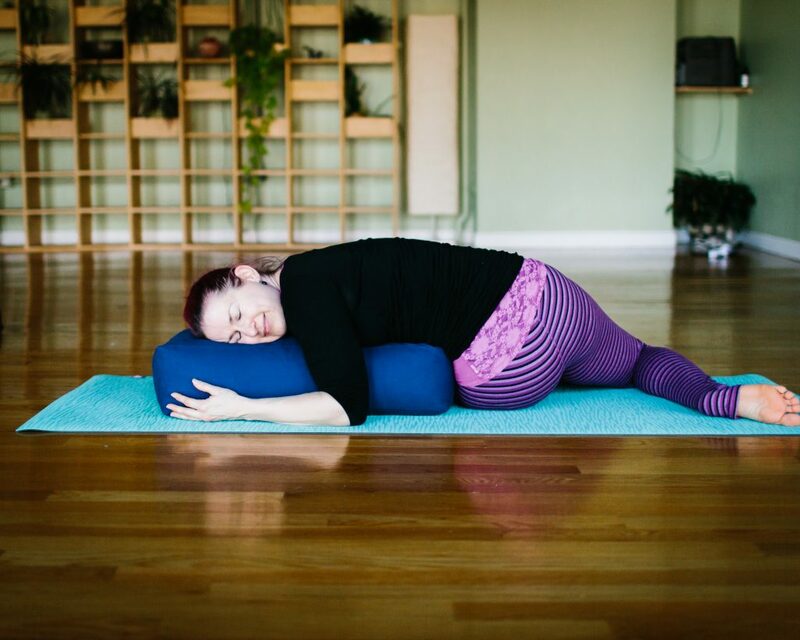 My personal favorite – this pose is deeply relaxing. It feels great for overused legs and can ease anxiety and stress. How to: Sit with one hip against the wall. “cartwheel” the legs up the wall and lie on your back. Place the feet on the wall to lift your hips and slide a prop (block, bolster, pillow, etc.) underneath your sacrum. You may need to wiggle around a bit to get comfortable. To correspond with Valentine’s Day, we have been practicing heart opening poses this month. Yes, this sounds a bit sappy, but heart openers have real benefits for our bodies. Many of us spend a lot of time at work sitting and slouching over a desk. You know how your mother always said that if you make a funny face, it will get stuck that way? In this case, she would be right! When we frequently use poor posture, the muscles in our chest tighten and our upper back muscles become long and weak. Our posture will “get stuck” this way unless we practice heart openers like cobra, upward dog, camel and numerous other poses. In addition to improved posture, recent studies have shown that heart openers can ease anxiety and depression and promote overall good health. Plus they feel really great. So strike a heart opening pose and enjoy the benefits!